MAX’S Branched Chain Amino Acids are the three amino acids L-leucine, L-Isoleucine and L-Valine. They are all known as essential amino acids because your body cannot actually make them so you need a constant supply every day to maintain good health. One of the key benefits of BCAA powder is their ability to stimulate protein synthesis in skeletal muscle. Other amino acids simply don’t have this capability. While all three amino acids play a vital role in muscle metabolism, L-leucine is the key amino acid that regulates protein synthesis, particularly after the body is subjected to the trauma of hard training. Leucine controls protein synthesis through a signalling pathway called Mammalian Target of Rapamycin or mTOR. As concentrations of Leucine increase in your system it signals mTOR that you have enough protein available for muscle building which effectively switches on protein synthesis. When Leucine levels drop, which usually occurs during and after hard training, protein synthesis is inhibited. 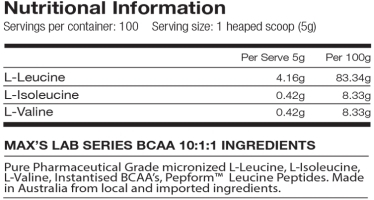 It gets quite a bit more technical than this, but what the research is showing is that a high level of Leucine is the critical factor when considering any BCAA formula for maximum muscle recovery and protein synthesis. Science has now validated a 10:1:1 ratio of Leucine to Isoleucine and Valine the most effective. But that’s not the whole story. Standard free form BCAA’s are relatively insoluble, meaning they are quite slow to absorb. This formula solves the issue by using fast and medium absorbing forms of these vital aminos, so be sure to buy the best BCAA powder in Australia and go with MAX’S.